I always have a hard time choosing a font to use at Thanksgiving. 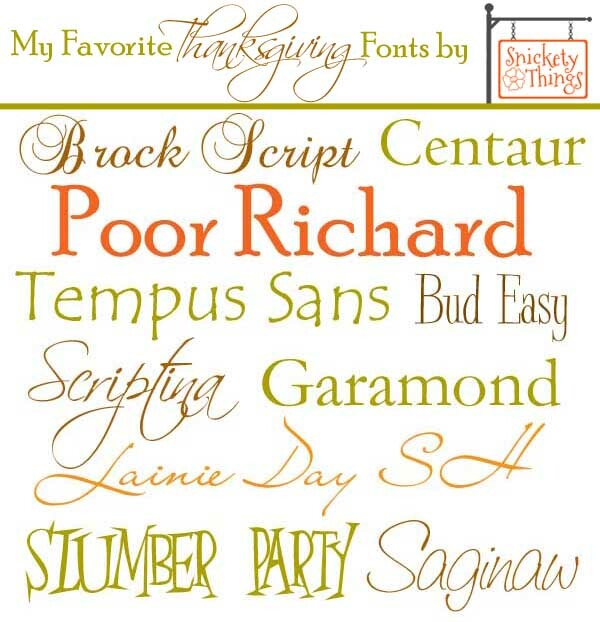 I mean, fonts don't just scream Thankful like Halloween fonts scream scary. I like to go for a mix of elegant and simple. It usually works very well. All of the fonts are available for free download except Garamond. It came with an Adobe product I purchased years ago, so check and see if you might already have it on your computer. There is also a very similar font called Apple Garamond that may work for you. Be sure to let me know how your projects turn out if you use these fonts. Thanks for sharing...they are great! Thank you! I'm a big fan of typography, and I love playing with the fonts every time I need to do an image for a blog post. I signed up for your email list, too. I love fonts! I'm working on Christmas fonts right now.